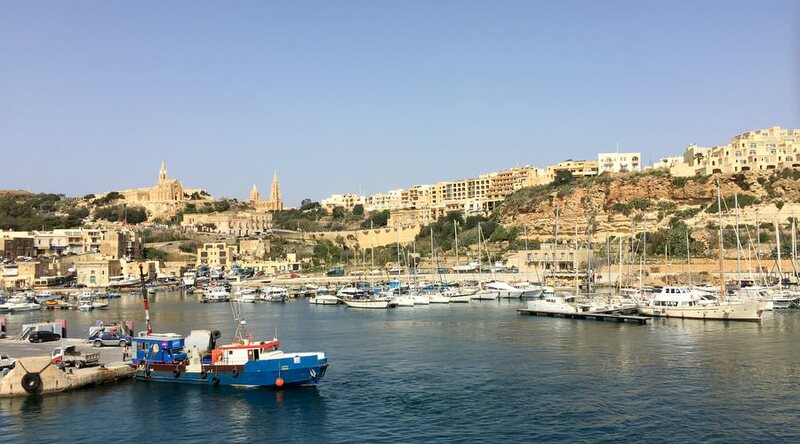 If you’re like us, you may not have realized that the island nation of Malta is actually an archipelago, with three of the islands – Malta, Gozo and Comino – being inhabited. Malta is the largest and most developed of the three, while Comino only has one small hotel on the entire island. 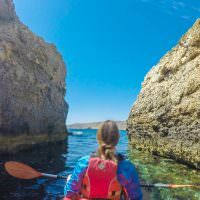 Gozo isn’t physically located in the middle of the island chain, but in terms of development, it offers the perfect middle ground between bustling Malta, and overly quiet Comino. 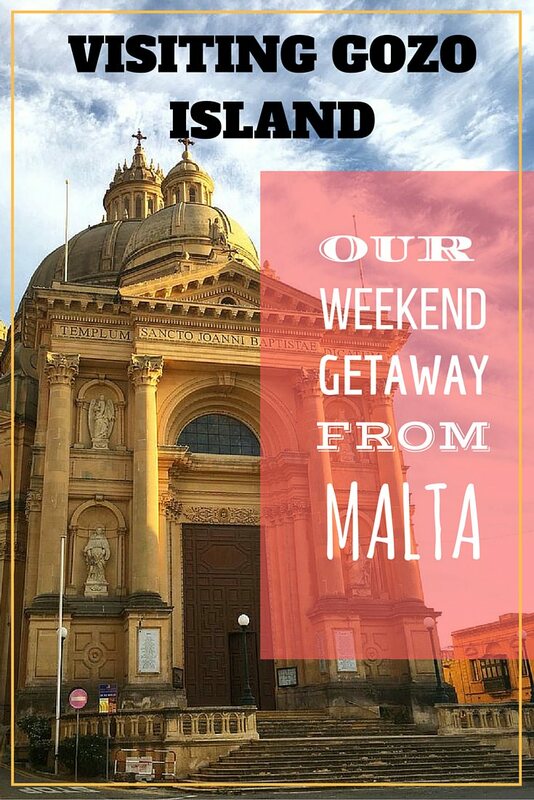 Gozo has enough amenities and activities to keep you busy for the weekend, while still offering plenty of peace and quiet. 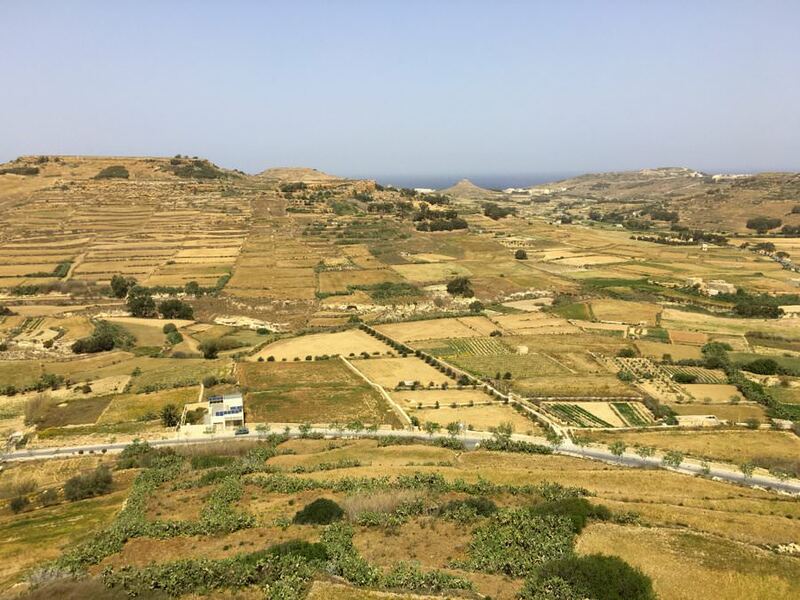 A quiet farmland area in Gozo – the walking here is great! 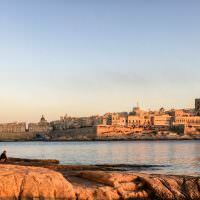 From our apartment in the popular Sliema area of Malta, we boarded local bus #222 to the Cirkewwa ferry terminal at the very northern reaches of Malta Island. After about an hour and a half, we arrived at the ferry and eagerly waited in line to board the boat. 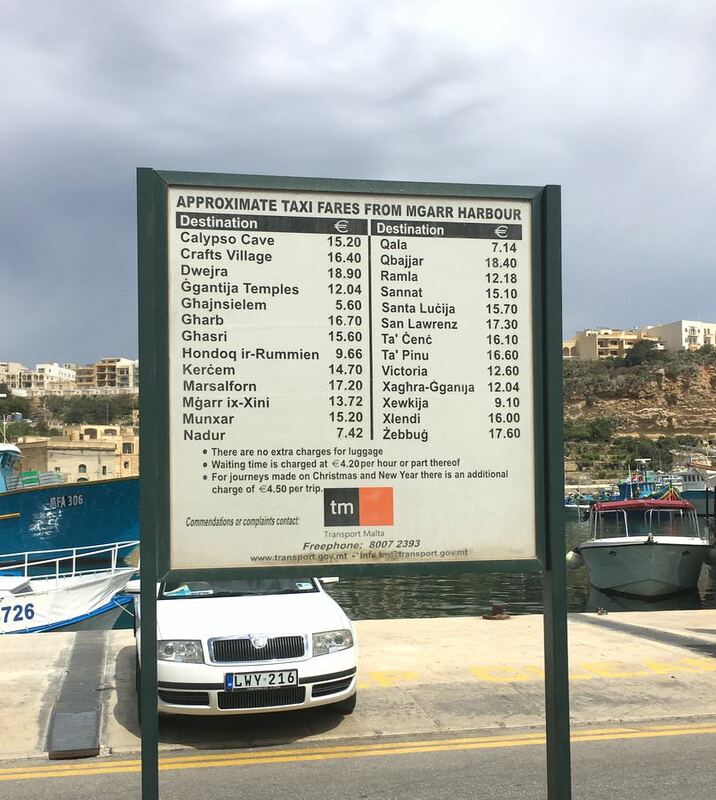 The ferries run quite frequently, and it was just a quick 25 minute journey on a modern (and well-maintained) ferry-boat, before arriving at the town of Mgarr in Gozo. It seemed strange to board the boat for “free”, but the way it works is that you pay on the way back from Gozo. So, in essence, if you wanted to travel from Malta and never leave Gozo by ferry, it would be free! If this doesn’t sound all that appealing, you’ll have to shell out €4.65 ($5.25). Once on Gozo, there are numerous ways to get around the island. During our three night stay, we travelled by foot, bicycle, kayak and bus! First up was the bus, which dropped us off at the new Quaint Boutique Hotel in Xewkija (rooms from €70 / $79), in the village of Xewkija (pronounced: shoo-key-ya). With a population of just 3,300 people, this is actually the 4th largest village on the island of Gozo. 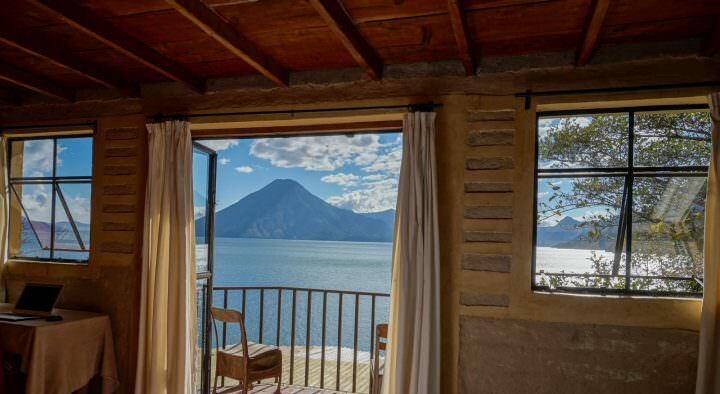 Our beautiful room at the Quaint Boutique Hotel – what a view from our balcony! Our hotel was located in the main square of the quiet village, which is dominated by the Church of Saint John The Baptist, or, The Rotunda. 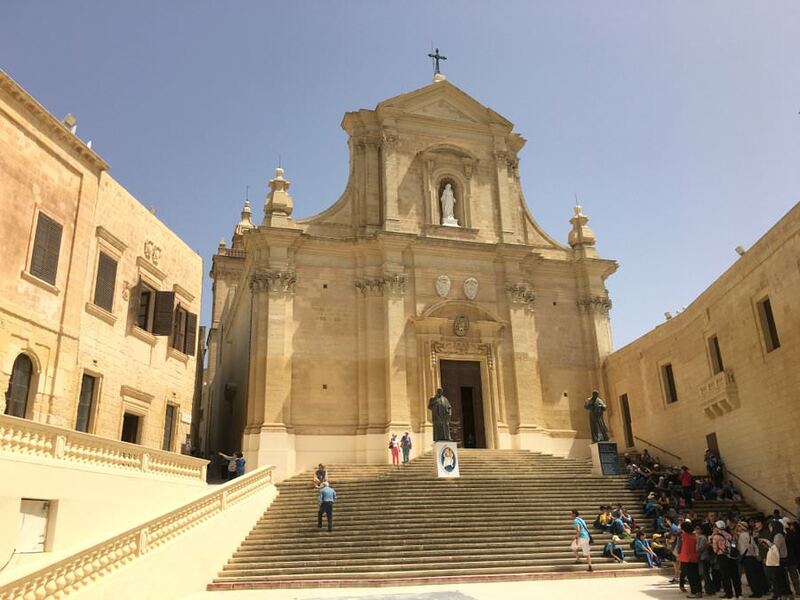 The Maltese people are predominantly Roman Catholic, and actually, there are over 350 churches on the islands of Malta and Gozo! Another thing to note about Malta is that most of the buildings and homes are made from Maltese Limestone, either globerigina (which is flaky and soft), or coralline (which is firmer and used for important structures). Practically every bit of architecture in Malta is the same sandstone colour, and the Rotunda was no exception. 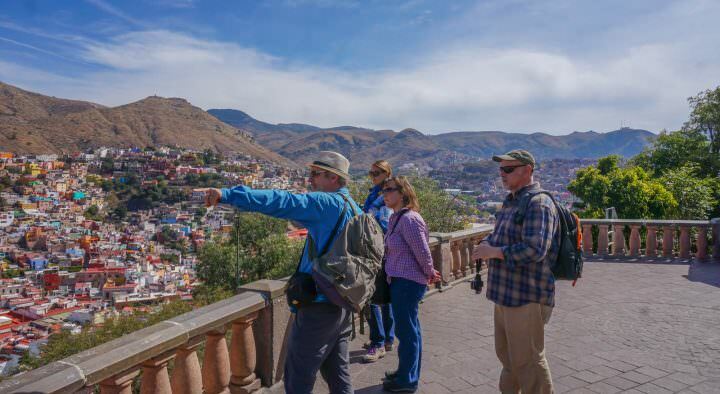 We had arrived in the early afternoon and after checking out our room, we were anxious to get out and explore. The owner of On Two Wheels met us at our hotel and provided us with helmets, locks and of course, the mountain bikes! This company does delivery and pick-up of the bikes, which was perfect for us as we weren’t staying in a popular tourist town. 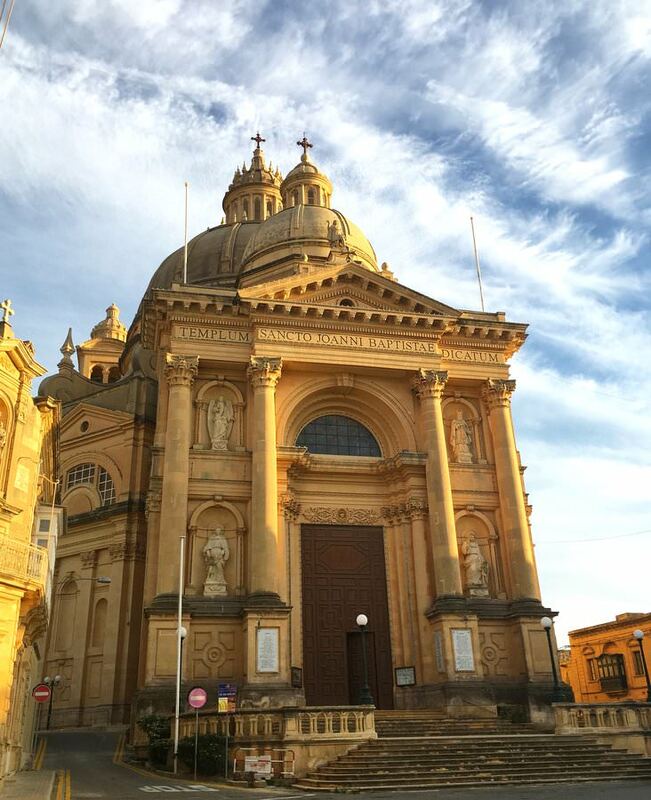 The capital city of Gozo is Victoria, and in the heart of the city is the Citadel, which has been the center of activity since the Neolithic ages (that’s 10,200 BC – 2,000BC! ), but it was first fortified during the Bronze Age (1500 BC). We knew we wanted to visit the Citadel first thing, so we set off on a (somewhat strenuous) bike ride. We’re ready to get some exercise! If I’m being honest, the reason the journey was a bit strenuous wasn’t because of the terrain, it was because we had been eating our way through Italy, and found ourselves not doing much exercise in the Balkans! Oh ya, we were out of shape, and were looking forward to all of the activities we had planned on Gozo. We cycled through narrow, limestone coloured lanes. We passed by local men playing bocci ball, and made our way through flat farmland. 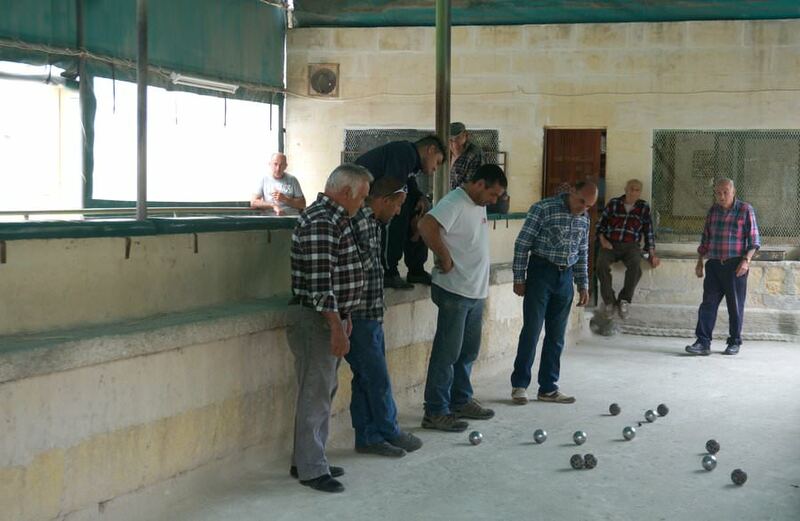 A very serious game of bocci ball! 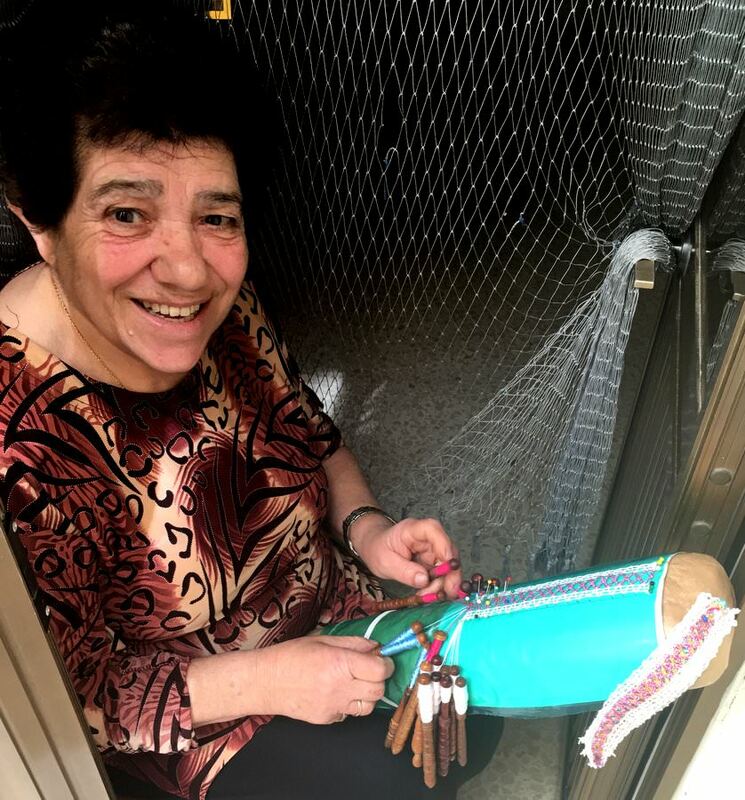 We took a break to not only catch our breath, but to have a look at the map, when out of nowhere, a short, elderly woman opened her door and started speaking to us in Maltese (Gozitans speak Maltese, but with a different accent). We obviously didn’t speak the same language as her, but through some hand gestures and smiles, she got the point across – we were being offered some water to drink on that very hot day. The kind woman topped up our water bottles, and gave us a wave goodbye. This type of encounter with the people isn’t unheard of in Gozo. Everywhere we went, the residents were waving and shouting “hello” as we whizzed by on our bikes. We found that the people in customer service on the island were welcoming and warm as well – at the restaurants, shops, tour agencies and at our hotel. As soon as we arrived in Victoria, we could see the Citadel, which sat high on a hill overlooking the surrounding city. Entering the Citadel walls, we were greeted by the Baroque-styled Cathedral of the Assumption, with its many steps leading to the entrance. Although the Cathedral of the Assumption was remarkable, the highlight of the Citadel for us was walking along the towering fort walls. Unfortunately, we didn’t time our visit all that well, and found ourselves in the scorching heat of the day, with no trees in site (make sure to bring lots of sunscreen and wear a hat when visiting). We needed shade, and fast. Luckily, we had read about a traditional Gozitan Restaurant called Ta’ Rikardu. Set in a gorgeous limestone building, the owner here serves up food and wine sourced directly from his farm and vineyard! Make sure to sample the traditional cheese of Gozo, Ġbejniet, which Rikardu makes himself, after hand-milking his sheep and goats! 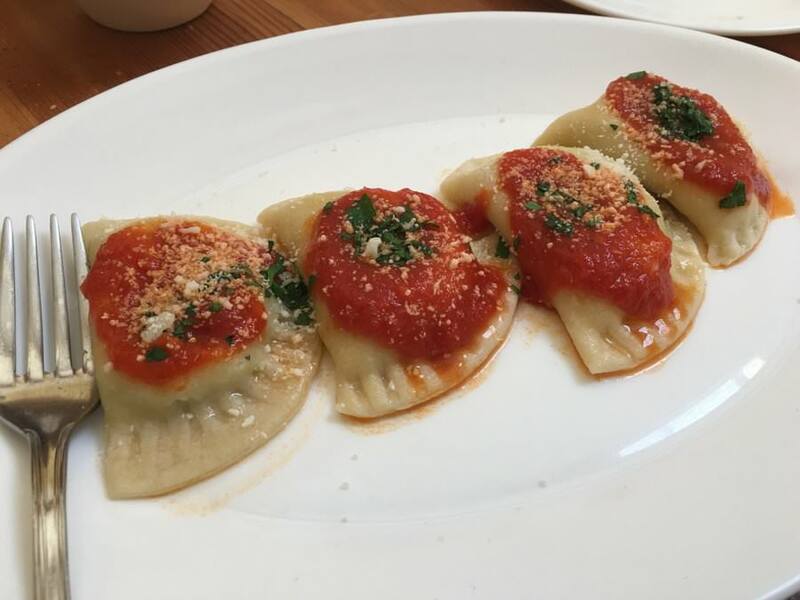 Also, don’t miss the goat cheese stuffed ravioli and of course, the Maltese bread. This is the ultimate lunch spot, and it gave us the break we needed from the hot afternoon sun. 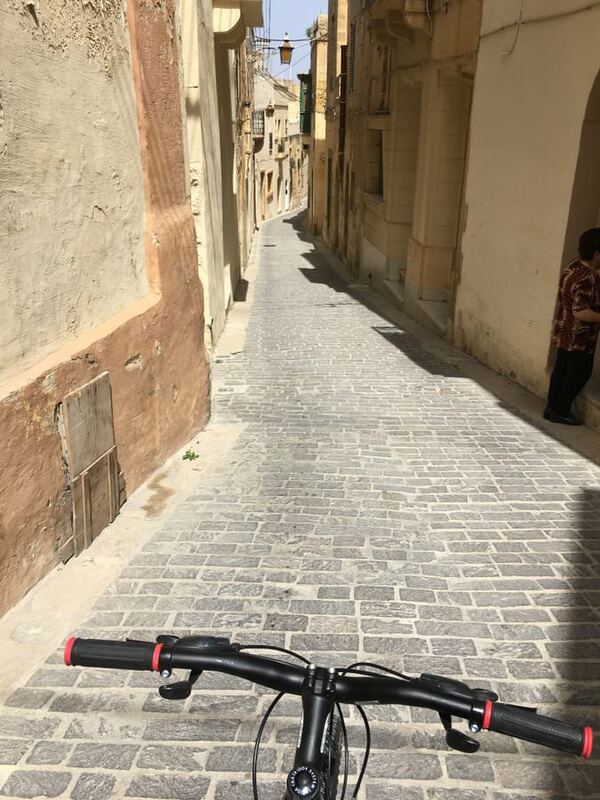 With full bellies, we explored more areas outside of the Citadel itself, including the narrow alleyways with traditional balconies – one of which was said to be the first ever balcony built in that style in Gozo! We browsed through the street markets, before popping in to the St. George’s Basilica, which was built between 1672 and 1678, from (you guessed it) limestone material. When we first stepped through the doors, I think our jaws literally dropped. 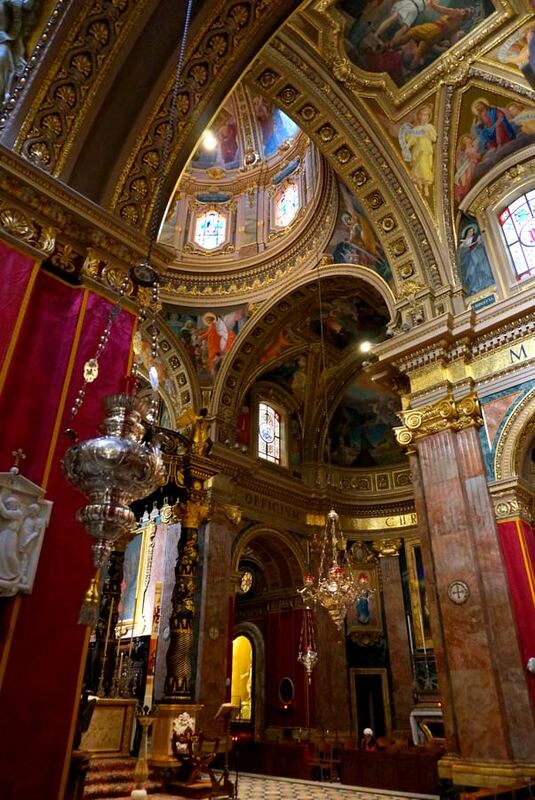 The interior was exquisite with colourful frescos, stained glass windows, and gold and marble stucco. There are 11 side chapels inside the Basilica, as well as a high altar, and a wooden statue of the patron saint, St. George. After a day of cycling around Victoria, we decided to make our way back to Xewkija. 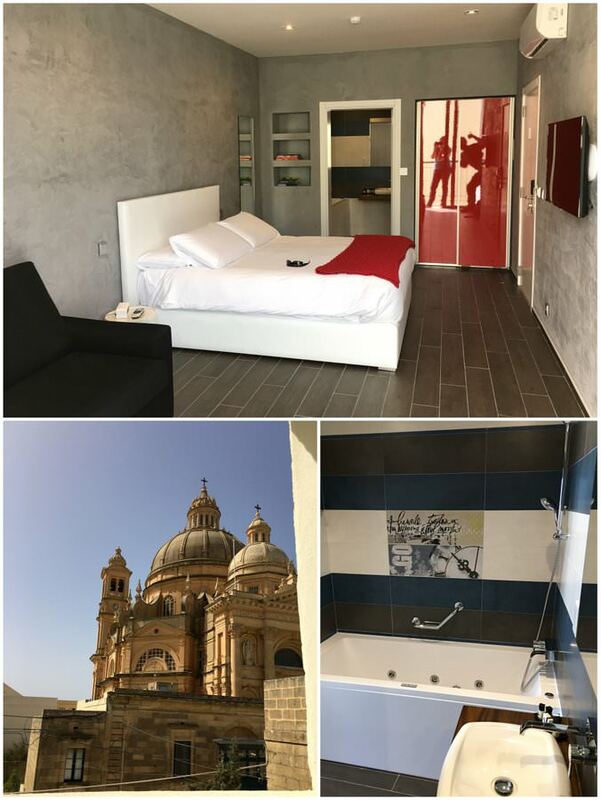 Our first day on Gozo Island was fantastic, but it only got better. The following days we had a 10km hike planned, and 14kms of kayaking! Stay tuned to hear more about our adventures on Gozo. To see all of our videos from our time spent in Malta, click here! If you have a smart phone, use the Google Maps app to find bus routes and schedules around the islands. Or, check online to see the bus schedule for Malta and Gozo. Bus times can be off by 15 minutes or so, but Google Maps will still be your best friend in Malta! The ferry boats have bathrooms and a restaurant. During the summer months, arrive early, as the boats can fill up fast – they run every 45 minutes. Click here for the ferry schedule. Don’t bother looking for where to pay for the ferry on the way to Gozo. You only pay for the return journey! 4 Days and up €7.00 / day. 1 Bus ticket costs €1.50 and is valid for 100 minutes. So, you can get all the way to your hotel in Gozo on the same bus ticket that you purchased in Malta. If you want to have a fancy, but affordable dinner in Gozo, get the Malta Discount Card and head to Country Terrace Restaurant in Mgarr, near where the ferries land. This place has a spectacular view and the best food in Malta, plus you get 50% off meals with the card. 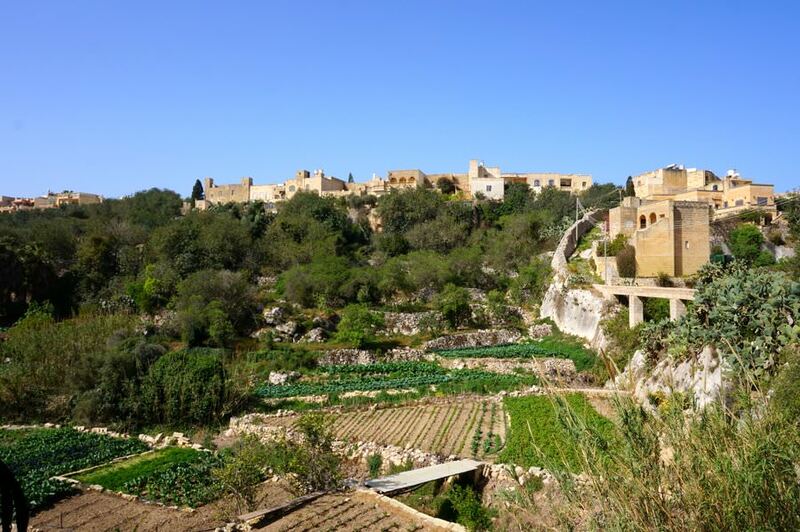 Be sure to go behind the Citadel for wonderful views of the Gozo countryside. 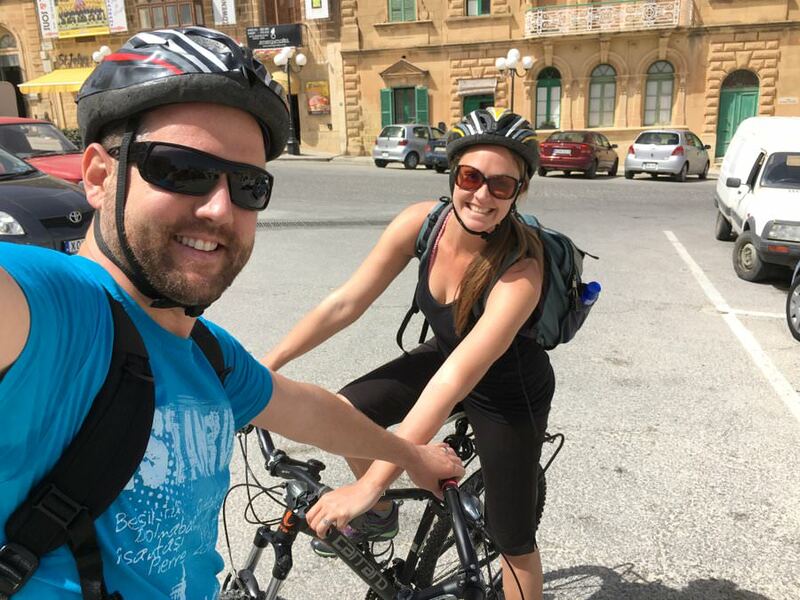 You can cycle many of The Great Walks of Gozo. To find the routes, Click Here and use the Google Maps app to make sure you’re going the right way. Brings back a lot of fond memories of my first wife and our 16 month visit to Malta. I was one of nine Canadians working in Libya the year Mr Gadaffi took over, 1969. At that time the island of Malta was considered to be about egual in size to our town of Edmonton, Alberta. We made one trip to Gozo. It’s just with-in the past couple of years that I learned of the stone relics there dating back to the time of Stonehedge. 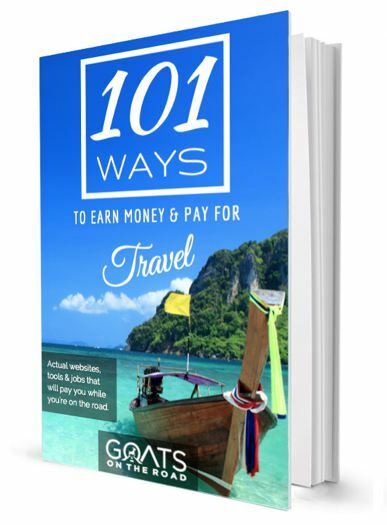 ‘Goats on the Road’; upon first seeing the name I was instantly reminded of actual goats being herded down the road in Malta in the heat of the day. Sorry guys! But What A Stink! What a beautiful well kept cathedral that St. Georges. I was remembering a fact we heard at that time; all the top soil in Malta had to be imported by ship.Don’t know if it’s actaully true. Would be interested to find out if the ‘BlackGold Saloon’ in Sliema survived the ages? I guess I’ll Google it. 16 months in Malta in the ’60’s?! Wow, I can’t even imagine waht that would have been like 🙂 You should definitely return to see it now! 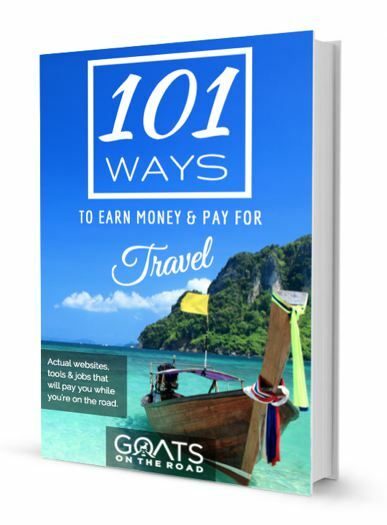 Great information “Goats”! I was just at an event last week with the Malta group promoting their tourism. Another agent mention that you were there visiting. What a coincidence and small world. I’m going to add Malta to my bucket list. Pura Vida! That’s so cool! Do you remember the agent’s name? And where were you having the event? Hello Canadian Goats, I enjoyed reading your blog about your stay in Malta. My husband is a Gozo Goat and I am a Maltese Goat. 🙂 We have been in Canada for over 50 years now and live in the Toronto area. I am so glad that I found your blog because it brought back a lot of memories for us. Happy traveling. p.s. Where in Canada are you from? We are from the Okanagan Valley originally, in B.C. But we lived in Calgary for 6 years.